Each year the Boston Brewing Company (makers of Sam Adams beers) puts on a homebrew contest and releases the best employee and public entry in a nationally distributed six-pack. 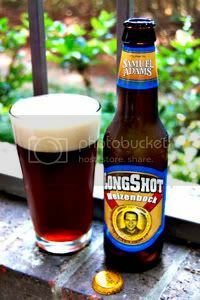 Two weeks ago, I reviewed one half of the 2007 Samuel Adams LongShot offerings, LongShot Grape Pale Ale. You can read a bit more about the contest in that review. This week, we turn to the 2007 winner in the public category, Rodney Kibzey's Weizenbock. Weizenbock is a top-fermenting, unfiltered wheat beer with a strength closer to that of Bock (hence the name). The profile is typically that of dark fruit, spices, bready wheat, and darker malts. According to the bottle, Rodney himself describes this particular beer as "deep amber in color with a full creamy body and a dark fruit and clove aroma." I'm sold, let's try some. Verdict: Complex and unique, Rodney has really brewed up something special here. I guess with these contest winning brews, the real test is whether people would actually buy them again. Well, I can confidently say that if this was a regular or seasonal offering, I'd happily pick up a six-pack or two a year. After trying this year's winners, I can't wait for next year's! We made it to the regionals with a straight up Amber Ale named "Jughugger". As much malt and East Kent Goldings as we threw at it, we couldn't compete with more eccentric beers.